By Aislinn Keely for the Fordham Ram. 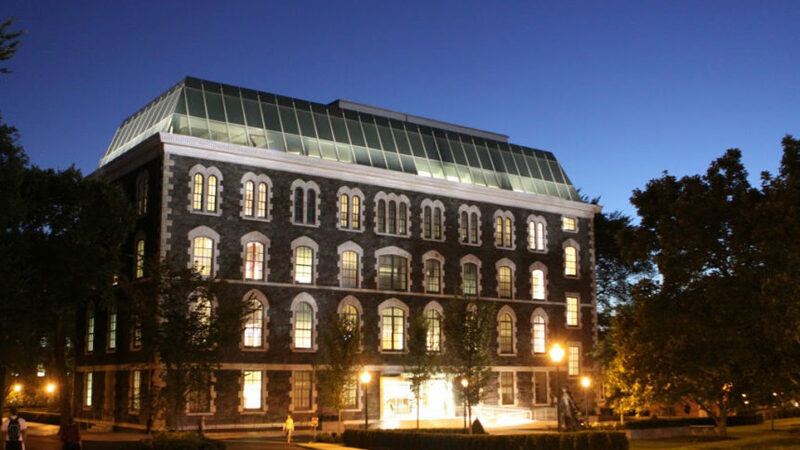 Fordham recently solidified its connections with the Sustainability Accounting Standards Board (SASB) by executing a formal collaboration with the organization. With this contract, the university is now the permanent venue for SASB’s meetings and annual symposium, as well as a research collaborator. SASB’s mission is to set industry-specific standards for corporate sustainability disclosure, according to its website. These standards help public corporations report financial material information or information on factors that affect a firm’s bottom line. This information helps investors make informed decisions, according to Matt Garrison, director of communications for SASB. “In a nutshell, it’s a way we create a framework for companies to be able to report on these issues and also help allow them to make better decisions around risk and return from the investor perspective,” he said. These issues include environmental concerns, but sustainability accounting reaches further than that, according to Garrison. Barbara Porco, Ph.D., director of the MS accounting program and Center for Professional Accounting Practices, has been at the forefront of the collaboration between Fordham and SASB. Much of the collaboration will work through her Center for Professional Accounting Practices. “You can think of it as the agent to all the activities,” she said. Among these activities is an upcoming speaker series that will begin this coming fall. Jean Rodgers, Ph.D., founder and chair of the SASB Standards Board, is slated to be the first guest, speaking in September. The series will run through the 2018-2019 academic year. Porco said the speaker series will serve as an opportunity to hear from high profile figures in the business and finance industries. “Students will be exposed to distinguished members of the accounting, finance and legal world through the speaker series and other events,” she said. Rodgers herself established an important voice in the world of sustainability accounting in her founding of the SASB, according to Porco. “The founder, Jean Rodgers, has always been a very important figure in this space of conscientious investing and reporting transparency,” she said. Others have taken notice of SASB’s work. Since 2011, Michael Bloomberg has become the chair of its board of directors, which includes two former chairpersons of the U.S. Securities and Exchange Commission among other high profile people in the business and finance world. Prior to the partnership, Porco said she had always valued the organization’s work. “When she [Rodgers] founded this organization at its very early stages, I was very interested in their mission,” she said. Porco attended SASB’s yearly symposiums and certain meetings and followed the organization’s growth. “In this very short period, this organization, which was in its infantile stages, really shifted its prominence in terms of its impact in policy setting and awareness of importance of making investors and employees and regulatory agencies and communities aware of what companies are doing,” she said. After one of SASB’s meetings, Porco and Rodgers spoke about the possibility of holding its yearly symposium at Fordham. Fordham later held the symposium, which Porco said was a success. This opened the door for continued collaboration, according to Porco. “After the symposium was over, Jean and I advanced discussions about potentially hosting other events,” she said. During those discussions, Porco said she and Rodgers realized Fordham’s future goals and SASB’s future goals were similar. “In that conversation, we then recognized so much of our aligned goals and mission complemented both Fordham’s mission and the SASB’s mission in so many ways that we started to see this as a bigger kind of relationship,” she said. After further discussion between both institutions, Fordham created the SASB Fordham Initiative Committee and the SASB Fordham Governance Board. From there, the agreement was drafted, vetted and executed, creating a collaboration between the two bodies. Fordham’s location and reputation for research made it a well-fitted partner for SASB, according to Garrison. “I think Fordham has a great reputation for research. Being in New York City and being centrally located around one of the largest capital markets in the world is important in terms of having perspective and connection,” he said. However, Garrison said the shared goals of the organizations are most important. “I think the most important thing is that there is a shared set of goals in terms of the field of sustainability accounting…I think both organizations are sort of future-focused,” he said. Garrison also said a university partnership will aid the work that SASB does, particularly its research. “A university has a natural deep pool of research and talent that could aid in that process,” he said. There are already plans to aid in that research. Porco said there have been discussions on ways students can get involved with research. “We’ve identified three topics that are timely and relevant and potentially very rewarding for the students to be involved in,” she said. Garrison said this effort will help keep SASB’s standards on the cutting edge. “We always need more help, and to be able to explore a lot of these new and emerging topics as they come along to make sure the standards are always up to date, it’s great to have that additional research,” he said. In addition to research opportunities, Garrison said SASB looks forward to having a hand in cultivating the next generation through its work at Fordham. “It’s a way to help educate the next generation of sustainability leaders,” he said.